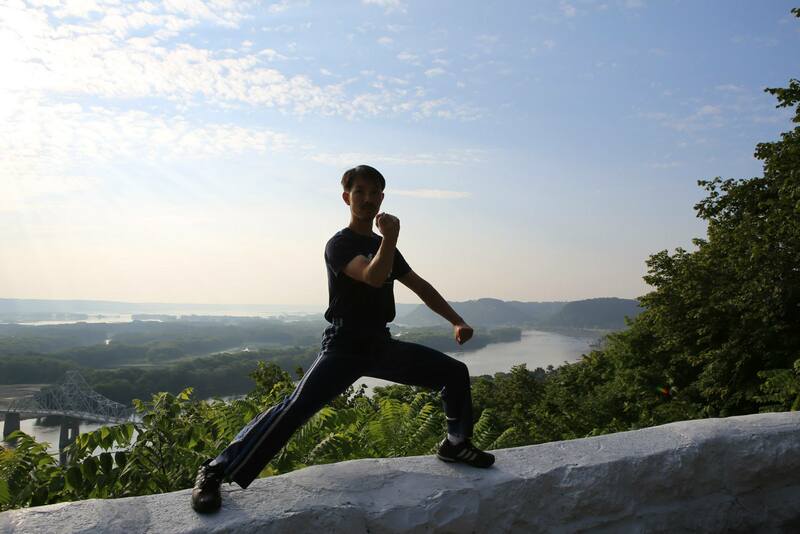 Precision is a word consistently used in Practical Method Taijiquan. But what does that mean in terms of practice? One aspect during Yilu is to not only complete the movement, but to know exactly where that move is aiming towards (which is why knowledge of applications is important). It is not enough to repeat the move, but to understand the energy alignment and aim. As our training continues to develop, and we become more aware of additional body parts (ie: to become aware of the elbow, become aware of the hip, etc. ), we are able to aim more pieces towards the same objective – making the move more effective as each body part compounds power on the next. That same exactness and consciousness of movement is required during push hands. When the foot is being moved, it’s not being moved forward or backwards, but to a very specific spot. The practitioner needs to be aware of exactly where that foot needs to be for that situation, and move it there with purpose. Every interaction needs to move towards a goal. Too often we push to get a feeling of the other person, to practice getting in a favourable position, waiting for the opponent to make a mistake to capitalize on, etc. This is following our own familiar pattern. 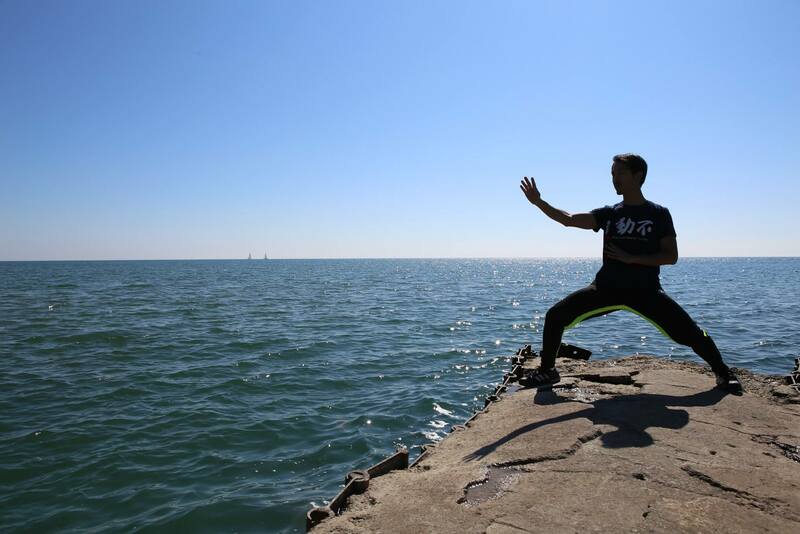 Within taijiquan we must be able to change the energy of the interaction without changing the shape. Efficiency of movement is not changing the position/contact points in order to get into a place that is familiar to us. Rather, it is often to be able to capitalize on the position you are already in. Become comfortable despite being in an awkward position. You have to be able to let go of your ideas on what is a bad position in order to achieve a certain objective. It is often when we feel our body is uncomfortable that our body fights back, getting in our own way of being able to do what we need to do. The mind needs to let go first, train, and the body will follow. 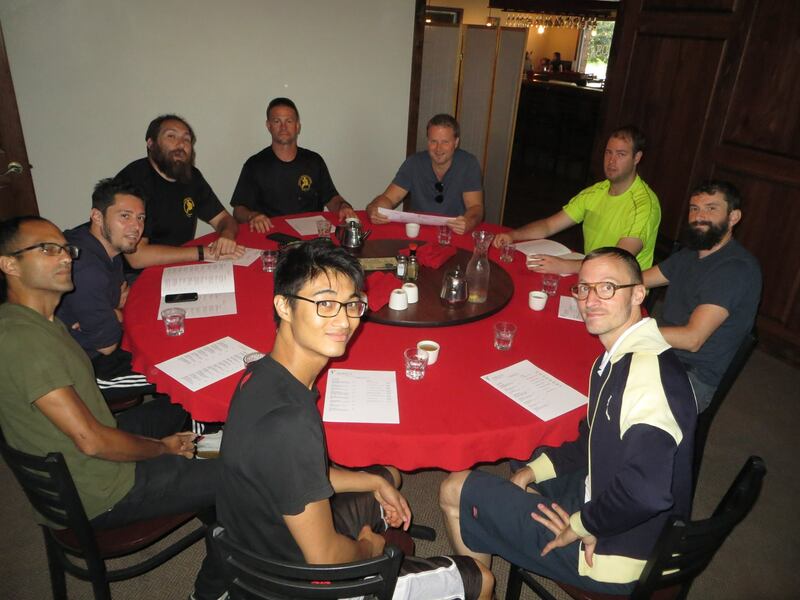 At some point one evening during the 2016 Iowa seminar, in Levi’s basement, a discussion occurred regarding the front kua and a particular orientation of it during a particular move. A statement was made about this requirement, followed by crickets chirping. Sensing that the moment was dying, I decided to wade in and stake my claim; to place myself at risk and bleed, hopefully. “I can do that! I can totally do that!” I crowed. It had been John Dahms, one of Master Chen’s senior disciples, who had stated the requirement. He said, “ok show me”. I sprang up and did something, as best I could, and his response was quick and direct – “You’re not doing it”. As deflated as possible I said “ok” and sat back down (I will come back to this). The discussion continued with some new indications and some new material, revitalised (with the help of my blood, I imagined). That moment still resonates with me many months later as I continue to work on the requirements laid out by John for that move on that evening. The truth is I lied. I knew I couldn’t do it when I offered myself up, but I also knew something else: if I felt psychologically prepared during the teachable moment I would not really be listening. Somehow I had to create a situation inside of myself where I would be truly receptive, and I knew from Master Chen that two useful qualities in this respect were a. obvious failure (“Invest in Loss”) and b. confusion (“I don’t know”). Even if I simulated these by artificially elevating myself and then coming crashing down in front of everyone it would be better than being ‘very competent’ during the learning process or even not offering myself up at all. The emotional risk is necessary – in other words, I must be ready to put myself aside, no matter how bad it feels so that I can have a chance at real learning, which is always in an unknown and uncomfortable place. I invested in loss, and in doing so, with John’s careful and attentive instruction, I invested in myself. 4) There should be no tossing or turning of the body, but there is a spiral stretch along the vertical rod. 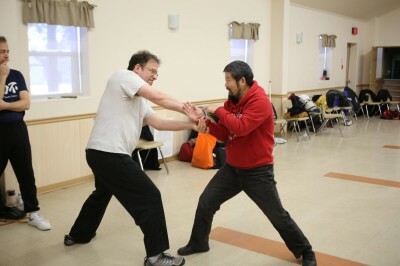 At the Ottawa Nov. 12-13, 2016 workshop, Master Chen Zhonghua talked about when doing twisting the towel or six sealing four closing, our hands and elbows must stay on the same line. Where was that line exactly? We often just imagined where that line was. He told us to use a physical object to guide us, and he used a stick to show us. In today’s class in Toronto, we started with twisting the towel and covered what I learned at the Ottawa workshop. 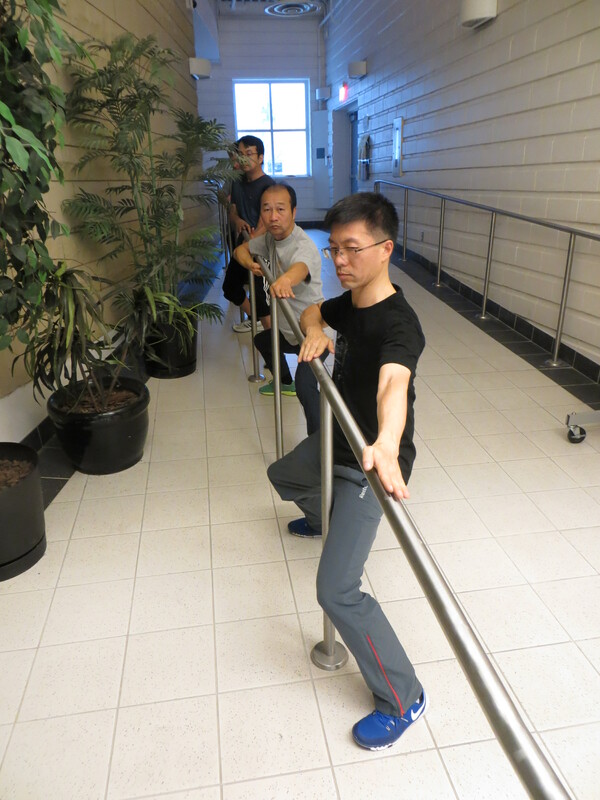 We went on to use the railing at the community centre to do the six sealing four closing exercise. The right side is considered the front side, and the left side is consider the rear side. Find a line that is parallel to your chest on the ground. Put your right foot at 45 degrees to the line with the heel touch the line. Put your left foot at 90 degrees to the line with the toes touch the line. I have a question regarding the training speed of Yilu. I remember Chen Laoshi saying, that doing two slow and one fast Yilu (and then again two slow, one fast) would be good. But I am not sure about the context anymore. Here on Daqinshan the „group“ prefer to do fast Yilus (like 4:30 minutes), instead of slow ones (like 8 minutes). What I would like to know is, if there is a certain method to train Yilu (like two slow – one fast) or if the speed is just depending on the circumstances (learning level, day`s form and so on). 1) Shovel out the front heel 2) Land the front toes and knee together 3) Extend the hands out Note: Don’t push the opponent in step 1 and 2.